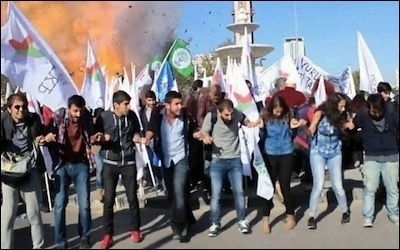 Explosions rip through a group of protesters staging an anti-government peace rally in Ankara, October 2015, resulting in the worst ever single terror attack in Turkey's modern history. The upsurge in violence helped propel President Erdoğan's Justice and Development Party (AKP) to a stronger showing in the November elections, but he did not receive enough votes to change the constitution. Secular and liberal Turks sighed with premature relief when on June 7, 2015, President Recep Tayyip Erdoğan's Justice and Development Party (Adalet ve Kalkınma Partisi, AKP) lost its parliamentary majority in general elections for the first time since it came to power in November 2002. With 41 percent of the national vote (compared with 49.8 percent in the 2011 general elections), the AKP won eighteen fewer seats than necessary to form a single-party government in Turkey's 550-member parliament. More importantly, its parliamentary seats fell widely short of the minimum number needed to rewrite the constitution in the way Erdoğan wanted it so as to introduce an executive presidential system that would give him uncontrolled powers with few checks and balances, if any. Undaunted by what looked like an election defeat, Erdoğan chose to toss the dice again. At his instructions, Prime Minister Ahmet Davutoğlu pretended to hold coalition negotiations with opposition parties while secretly laying the groundwork for snap elections. In Erdoğan's thinking, the loss of a few more seats would make no difference to AKP power, but re-winning a parliamentary majority would make the situation totally different. Then a terrible wave of violence gripped Turkey. First, the separatist Kurdistan Workers' Party (Partiya Karkerên Kurdistan, PKK), which had been fighting a guerrilla war from mountain hideouts in northern Iraq, declared an end to its unilateral ceasefire begun in 2013. Then on July 20, a Turkish suicide bomber killed more than thirty people at a pro-Kurdish gathering in the small town of Suruc. Claiming that the Turkish state had a secret role in the bombing, the PKK killed two policemen in the town of Ceylanpinar. The three-decades-old violence between the Turkish and Kurdish communities had suddenly roared back with a vengeance. In one of Turkey's bloodiest summers ever, more than a thousand PKK fighters and Turkish security officials were killed. Then in October, ISIS attacked in the Turkish capital. Two suicide bombers, one Turkish the other Syrian, killed some one hundred people at a pro-peace rally in the heart of Ankara, the worst single terror attack in the country's modern history. By then, Erdoğan had already dissolved parliament and called for early elections on November 1, calculating that the wave of instability would push frightened voters toward single-party rule. Erdoğan's gamble paid off. The elections gave the AKP a comfortable victory and a mandate to rule until 2019: 49.5 percent of the national vote, or 317 parliamentary seats, sufficient to form a single-party government but still short of the magical number of 330 necessary to bring a constitutional amendment up for referendum. Once again, political Islam had won in Turkey. But how, in a span of just five months, did a government mired in rising unemployment, economic slowdown, terror attacks, and soldiers' funerals succeed in increasing its national vote by about nine percentage points? A combination of factors offers some clues. The AKP's renewed victory illustrates the hopelessly divided and polarized state of the Turkish political scene. To begin with, not all Kurds are PKK supporters. The summer-long violence between the PKK and the Turkish military seems to have won over those Kurds with relatively more loyalist sentiments toward Turkey as well as those who sympathize with the Islamist AKP for reasons of piety. This caused a shift of votes, measured at 1.4 percentage points, from the pro-Kurdish Peoples' Democratic Party (HDP) to the AKP. The AKP's renewed victory illustrates the hopelessly divided and polarized state of the Turkish political scene. More importantly, the violence improved the AKP's position vis-à-vis the Nationalist Movement Party (MHP), which shares more or less the same voter base. In the June elections, some of the AKP's votes seem to have shifted to the MHP (which won 16.3 percent of the balloting overall), apparently due to nationalist disapproval of the AKP's peace overtures to the Kurds. Once they scrapped the peace process and launched an all-out war against the restive Kurdish minority, Erdoğan and Davutoğlu could boast of their newfound nationalist spirit. In the November elections, the MHP lost 4.1 percent—all of which apparently went to the AKP. Add to this the disappearance from the political scene of two splinter parties, one with an Islamist and the other with nationalist manifestos, which had won 2 percent of the vote on June 7, allowing the AKP to pick up another 1.5 percent of the overall vote. The opposition Nationalist Movement Party (MHP) shares more or less the same voter base with the Justice and Development Party (AKP) and gained strength in the June 2015 general elections. 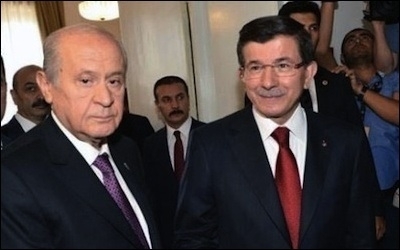 MHP leader Devlet Bahceli (left) sat down for inconclusive talks with prime minister Ahmet Davutoğlu (right) in August 2015, but as Turkey spiraled into violence, and Davutoglu's AKP party scrapped its peace process with the Kurds, the MHP lost ground in the November balloting. Finally, in the June elections, some AKP voters apparently refrained from voting in the face of Erdoğan's lavish public lifestyle, his assertive unconstitutional intervention in party politics, and growing allegations of corruption and nepotism. Ipsos, the global market research company, found that nearly half of those who had abstained were AKP voters. Yet they returned to the ballot box in November to help their ailing party, earning the AKP another 2 percentage points. Was this "non-buyer's remorse" or something more troubling? Are Turks displaying a form of Stockholm syndrome in which hostages, psychologically beaten into submission, develop sympathy and positive feelings toward their oppressors? Interestingly, a study released shortly before the November elections found that only a quarter of Turks were not afraid of Erdoğan; as many as 68.5 percent said they were. The research also found that even some of Erdoğan's own supporters were afraid of him. In any event, the turnout rate was nearly 4 percent higher in November than in June—half of which apparently went to the AKP. There is a president with de facto power in the country, not a symbolic one. The president should conduct his duties for the nation directly but within his authority. Whether one accepts it or not, Turkey's administrative system has changed. Now, what should be done is to update this de facto situation in the legal framework of the constitution. To legitimize his rule by changing the constitution, his AKP party needs at least 330 seats but has only 317. Since the November elections, all three of the major opposition parties have said that they would not support any AKP-sponsored amendment in favor of an executive presidential system. But in Turkish politics nothing is impossible. The secular, main opposition Republican People's Party (CHP) is unlikely to be in favor of Erdoğan's sultanate-like presidential system under any scenario. The Nationalist Movement Party has firmly denied any potential support although it has cooperated with the AKP in some controversial legislative work in the past, such as a bill that legalized the Islamic headscarf on university campuses. That leaves the pro-Kurdish HDP as Erdoğan's only possible partner. The Kurdish party's rhetoric on the presidential system has been tricky. It refused to support any presidential amendment "in a unitary Turkey" but does that mean it would withhold support from an AKP-sponsored presidential bill in a "federal Turkey?" A federal Turkey, meaning one with an autonomous Kurdish region, is the HDP's main objective. Thus it could find itself in a transactional relationship with the AKP for some degree of Kurdish autonomy in return for supporting Erdoğan's modern-day, elected sultanate. Recep Tayyip Erdoğan is tirelessly seeking to rewrite the Turkish constitution to increase his control of the country in its entirety. While a study released shortly before the November elections found that more than 68 percent of Turks were afraid of him, his party still won a comfortable election victory and gained enough seats in parliament to form a single-party government although still short of the number needed to bring a constitutional amendment up for referendum. For that to happen, the current wave of violence between Kurds and the Turkish military would have to come to a halt. At the beginning of 2016, there were no such signs, and what looked like a localized civil war, contained mainly to Kurdish-majority southeast Turkey, continued to claim lives daily. Worse, Erdoğan and the Davutoğlu government look less prone to any reconciliation. Even a call for peace could be deemed "terrorist propaganda." even mention the PKK. Shortly after that, Turkish police detained scores of academics for signing a declaration denouncing military operations against the PKK. In their declaration, the so-called traitors wrote that they refused to be "a party to the crime" and called on the government to halt what they said was a "massacre." Just because they have titles such as professor [or] doctor in front of their names does not make them enlightened. These are dark people. They are villains and vile because those who side with the villains are villains themselves. Alongside any fresh ceasefire—not likely but not altogether impossible—HDP will want renewed talks for a political solution to Turkey's Kurdish dilemma. Beginning in 2011, Erdoğan did enter into negotiations with the Kurds and convinced them to call for a ceasefire in 2013. He might try that again. Davutoğlu often publicly presents a milder Islamist posture than Erdoğan. But both Erdoğan and the Kurds would have less appetite this time for such a new political adventure. Kurds trust him less than they did between 2011 and 2013. At the same time, Erdoğan has discovered that he wins more votes if he plays to the nationalist Turkish constituencies rather than Kurdish ones. He will be more reluctant to shake hands with the Kurds than he was in 2013 and is able to read the election results of June and November 2015. Erdoğan's ambitions also leave in limbo his right-hand man, Prime Minister Ahmet Davutoğlu. In Turkey, the prime minister is the head of the executive while the president's constitutionally-defined role is largely symbolic. When Davutoğlu was campaigning to win more votes for the AKP in 2015, he was in a real sense campaigning to end his own political career as the chief executive of the country. There is some speculation that Davutoğlu, who often publicly presents a milder Islamist posture than the president, may eventually break with his patron and his authoritarian style, especially in light of the charges of corruption, favoritism and extravagance that beset the president. However, that expectation is too optimistic given Davutoğlu's character and devotion to ideology. Since Davutoğlu was chosen by Erdoğan to succeed him as prime minister in the summer of 2014, he has alternated between conducting himself ethically and in a Machiavellian fashion. 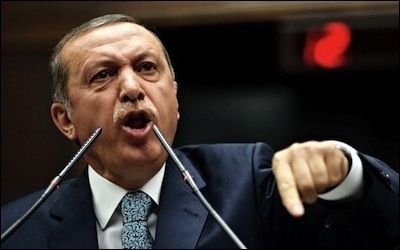 While he may even view himself as a paladin for advancing the interests of Turkey and Islam (or Islamism), he knows that in order to further these goals he must continue to serve the man whom he sees as the champion of Turkish Islamism, Recep Tayyip Erdoğan. He must, therefore, remain prime minister and, as such, must ignore the issues that challenge his ethical and religious side. This helps explain why Davutoğlu repeatedly uses one particular word in public speeches: "dawa" (dava in Turkish) or the "political cause." His loyalty is not to the seat he occupies or to worldly ambitions but to the struggle for the advancement of Islamism under the Turkish banner, to the dawa. It is unlikely then to expect Davutoğlu to betray his boss or the dawa. In Turkish politics, Erdoğan remains unrivalled. There is no credible indication that any of the three opposition parties could increase their votes so as to threaten the AKP in the near future, and there is no internal rival for leadership. The main opposition Republican People's Party's returns seem to be stuck in neutral, at a mere 25.4 percent in the November 2015 balloting, down marginally from 25.9 in 2011. The nationalist MHP is in the midst of a chaotic leadership race while its national figures edge toward a number below the 10 percent threshold necessary for parliamentary representation (11.7 percent in the November 2015 election). Although it won parliamentary representation for the first time in history in 2015, the pro-Kurdish HDP conducts itself under the violent shadow of the militant PKK. 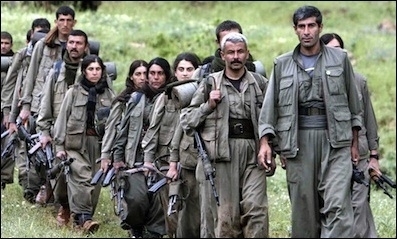 The separatist Kurdistan Workers' Party (PKK) recently declared an end to its unilateral ceasefire begun in 2013. Although the Turks have a clear military advantage, the Kurdish minority also possesses a secret weapon: The fertility rate in Kurdish-speaking parts of Turkey is higher than in the Turkish-majority regions. The Kurds may emerge as the Turkish Islamists' main rivals in the not-too-distant future simply by having more babies. There are, moreover, sociopolitical and demographic reasons to anticipate that both Islamists and Kurds will perform better in any future Turkish election. From a political perspective, Turkey is becoming increasingly right-wing and religiously conservative. F. Michael Wuthrich of the University of Kansas' Center for Global and International Studies has demonstrated that Turkish voting bloc patterns have progressively shifted to the right from 59.8 percent in 1950 to 66.7 percent in 2011. This pattern, presumably still in progress, will work in favor of the AKP or any other political party championing Islamist-nationalist ideas. In 2015, Erdoğan boasted that the number of students studying to be imams rose from a mere 60,000 when his party first came to power in 2002 to 1.2 million in 2015. When those students reach the voting age of eighteen, marry, and have children, their pious families will likely form a new army of five to six million AKP voters. But the Kurds also have their own demographic advantages. Presently, the total fertility rate in eastern and southeastern, Kurdish-speaking Turkey is 3.41, compared to an average of 2.09 in the non-eastern, Turkish-speaking areas. For his part, Erdoğan has urged every Turkish family to have "at least three, if possible more" children. But things are not moving as he wishes. The total fertility rate in Turkey dropped from 4.33 in 1978 to 2.26 in 2013. Unsurprisingly, it currently stands at 3.76 for women with no education and at 1.66 for women with high school or higher degrees. Just like less-educated (and more devout) Turks grew in number and percentages over the past decades and brought Erdoğan to power simply by combining demographics and the ballot box, the Kurds may, therefore, emerge as the Turkish Islamists' main rivals in the not-too-distant future simply by using the same political weapon. Turkey seems to be stuck between two unpleasant options: Erdoğan's increasingly authoritarian, de facto one-man rule or the same rule legitimized by a rewritten constitution. The sultan will not give up his ambition to raise "pious generations." But do Turks care how their country is trending? Nearly half of AKP voters do not think they live in a democratic country but are happy to vote for the party anyway. A recent survey by Kadir Has University in Istanbul suggests that a substantial number of Turks are fully aware of the current trajectory. The survey found that 56.5 percent of Turks do not think Turkey is a democratic country while 36.1 percent think it is. Similarly, 59 percent think that there is no freedom of thought while 33.1 percent said there is. A mere 9 percent of Turks think there "definitely" is a free press in the country although another 31.3 percent agree to some extent. These numbers leave almost 60 percent who are sure they no longer have these civil liberties. More alarmingly, when narrowed down to AKP voters—49.5 percent according to the November 2015 elections—the study finds that these Turks do not care all that much about democratic values. Only 58.3 percent of those who vote for the AKP think Turkey is a democratic country; 56.7 percent think there is freedom of thought in the country, and 54.8 percent think there is a free press. In other words, nearly half of AKP voters do not think they live in a democratic country but are happy to vote for the party anyway, without blaming it for the democratic deficit. This is truly worrying for Turkey and, looking beyond Anatolia, for NATO (of which Turkey is a member), and the EU (to which Turkey aspires). The country is being dragged into increasing levels of authoritarianism with few if any checks and balances. The opposition parties fail to impress the voters and show no sign of credibly challenging Islamist rule. An unresolved rift between a growing Kurdish population and a shrinking Turkish one has the potential to explode, especially as Kurds outside Turkey gain de facto independence. Meanwhile, a frightening number of Turks just do not seem to care that the representative, democratic republic bequeathed to them by Kemal Atatürk is becoming just one more relic in the junkyard of history. Hürriyet (Istanbul), Jan. 27, 2016. Al-Jazeera America (New York), Nov. 5, 2015. BBC News, July 20, 2015. Al-Jazeera (Doha), July 22, 2015. BBC News, Oct. 10, 2015. Emre Çetin, blog, Jan. 11, 2015. Ertuğrul Özkök, "The Turkish Public Is Afraid of the President," Hürriyet, Oct. 22, 2015. Today's Zaman (Istanbul), Dec. 30, 2015. Bianet (Istanbul), Feb. 10, 2008. Akif Beki, "Başkanlık 'federasyon'da tıkanıyor," Hürriyet, Jan. 7, 2016. The Washington Post, Jan. 15, 2016. U.S. News and World Report, Jan. 15, 2016. Birgün Gazetesi (Istanbul), Aug. 6, 2015. Taha Akyol, "Where to, CHP?" Hürriyet, Jan. 19, 2016. F. Michael Wuthrich, National Elections in Turkey: People, Politics, and the Party System (Syracuse: Syracuse University Press, 2015), p. 30. Cumhüriyet (Istanbul), Sept. 28, 2015. A. Banu Ergöçmen, presentation, Hacettepe University's Institute of Population Studies, Ankara, May 11, 2015. Fox News, Feb. 13, 2015. Hürriyet, Jan. 27, 2016; "Eğilimler Araştırması 2015 Sonuçları Açıklandı," Kadir Has University, Istanbul. Related Topics: Democracy and Islam, Turkey and Turks | Burak Bekdil | Spring 2016 MEQ receive the latest by email: subscribe to the free mef mailing list This text may be reposted or forwarded so long as it is presented as an integral whole with complete and accurate information provided about its author, date, place of publication, and original URL.